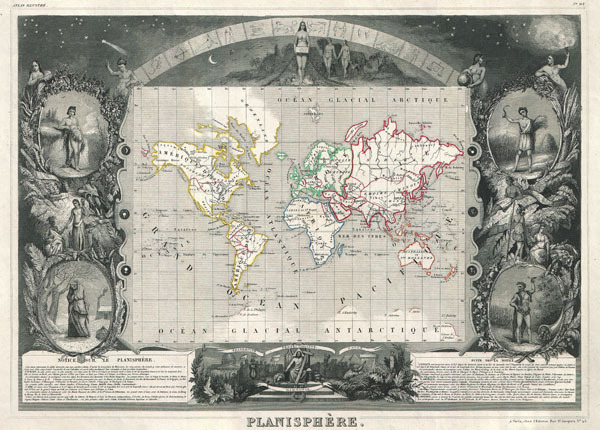 This is a rare 1847 map of the world by French map publisher Victor Levasseur. Probably Levassuer's most sought after atlas map. Depicts the world on a Mercator projection with continents and some countries defined with outline color. Offers a few elements of geographical interest. This map shows the Oregon-Canada border extending northward into what is today British Columbia along the 54°40' north parallel. Map layout, if not the map itself, predates acquisition of California and Texas by the United States. Traces of Antarctica appear along the bottom of the map where various explorers sighted land. The entire map is surrounded by a fantastic allegorical border typical of Levasseur's Atlas Illustre. Designed by Raimond Bonheur, father of the famous French artist Rosa Bonheur, this is one of the most fantastic border designs to appear in any 19th century map. The map proper is flanked on either side by figures representing the four seasons. At the top of the map stars dot the firmament behind the arc of the Zodiac. Under the Zodiac Adam and Even appear, hand in hand, walking toward a four breasted female figure, possibly Pandora, holding a box. Below the map Jesus sits enthroned with Moses, the Pyramids of Egypt, a domed hall, and other figures to either side. Text at the base of the map describes each of the five recognized continents. Levassuer, V., Atlas National Illustre des 86 Departements et des Possessions de La France, 1847 edition. Very good condition. Not notable flaws. Blank on verso. National Library of Australia, 1847 MAP NK 6095.